If left untreated, missing teeth can have serious consequences for your dentition. Dr. Richard Silvera and his team at Century City Dental Associates in Los Angeles can help restore your full smile and correct damage caused by tooth loss. Much like dental implants, implant supported dentures rely on a series of surgically placed titanium posts to hold the dentures in place. This results in a stimulated jaw, mitigating bone atrophy which is a common side effect of multiple tooth loss. Additionally, irritation caused by the instability of traditional dentures is eliminated, reducing uncomfortable inflammation and lowering the chances of sores cause by dentures and / or needing to be refitted. Implant supported dentures do not cover the palate allowing the wearers to taste food naturally. They also will not pull out of the mouth unintentionally (as do dentures on occasion) making chewing steak or corn on the cob completely possible. Los Angeles implant dentist, Dr. Silvera specializes in providing patients with the right implant supported denture treatment that fulfills their specific needs. In addition to traditional implants, Dr. Silvera also offers Los Angeles patients mini dental implants that can be an anchor for dentures. Unlike traditional implants, these mini implants are much smaller and can be utilized the same way traditional implants are when it comes to stabilizing dentures. Getting 4-8 dental implants to restore a full set of teeth is a very cost effective solution for tooth replacement when compared to placing a full set of dental implants or constantly replacing dentures and bridges. 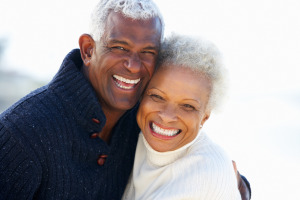 Based on the patient’s unique restoration goals and needs, Dr. Silvera may recommend one of two forms of stabilized dentures: bar retained or ball-retained. With bar-retained mini dentures, a thin metal bar is attached to pre-placed implants. The over denture then fits over the bar and is held in place by small attachments. In contrast, ball-retained dentures are held in place by implant attachments. These attachments “snap” into place, keeping the denture stabilized yet are removable. Placing this hybrid denture treatment is much like capping dental implants with crowns; the only difference is that instead of covering the abutments with a crown, overdentures are used to provide the patient with natural looking and functioning teeth. At Century City Dental Associates, Dr. Silvera uses the latest in dental technology to leave patients with long lasting results that improve their oral health. If you are tired of using traditional dentures, contact our Los Angeles office today and learn more about the impact implant-supported dentures can have on your life.